This is too much. Last time, they sell the form for RM50. Now they distribute fake form to take bank account information such as bank account number and photocopy of account bank. The original form did not even mention about bank. Be careful! 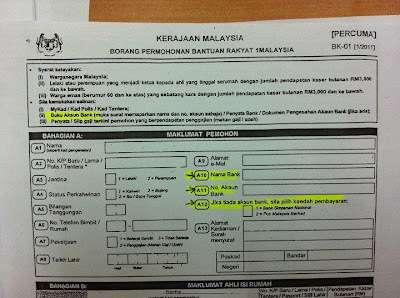 Fake BR1M form! This is definitely someone forged BR1M the form, in order to obtain people’s confidential information! share please! The original version only require your address and address, no bank account. So please, get your form from authorised person or agency. Download the form from trusted source like Ministry Of Finance. This is a serious issue that should not be taken lightly. You might risk your bank details to criminals. Make sure you only share what is necessary that are required for the form. Be careful guys. NextActivate your Facebook Timeline Now!